Just as Maddie was starting to feel better, her Dad got a real taste of exactly what was troubling the baby. Suffice it to say that Mom had to take over sole caretaking responsibilities while dad battled the nasty stomach bug. 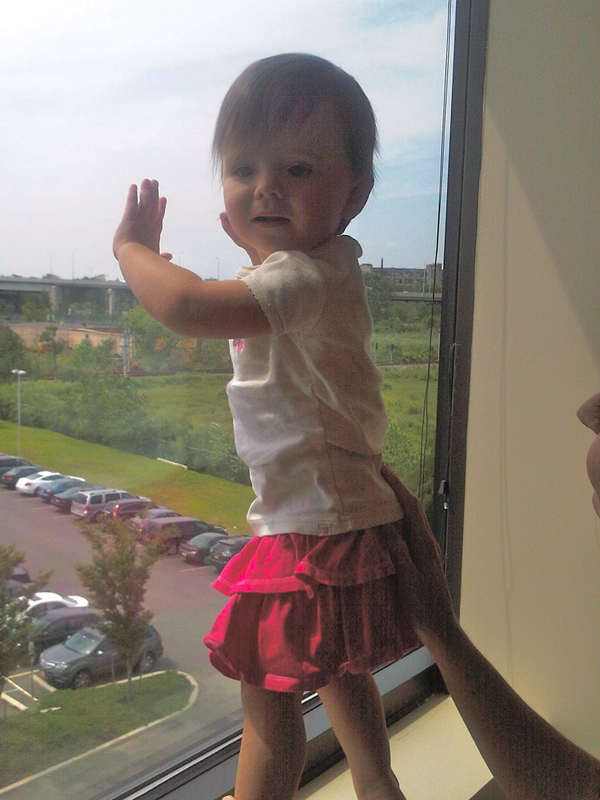 While Mom set her sights on Maddie, the baby had a new adversary to tackle. For weeks now, we have not been able to stop Maddie from digging into the kitchen trash and removing items of interest. It was a game at first, but once it became a contest of wills, there was no stopping Maddie from dumpster diving. That’s when Maddie’s parents decided to flip the script on the baby. We tracked down a taller trashcan that’s equipped with a butterfly lid. This lids opens up and out. At first, Maddie was determined to crack the code. She tried to coax the can open. When that didn’t work, it was time for more drastic measures. Maddie started placing items on top of can and knocking them off. But no matter how much abuse she heaped upon the new can, she couldn’t get inside. It only took about a half an hour for Maddie to lose all interest in the new trashcan. When you have an opponent like the Mad Madster, you have to celebrate the small victories! 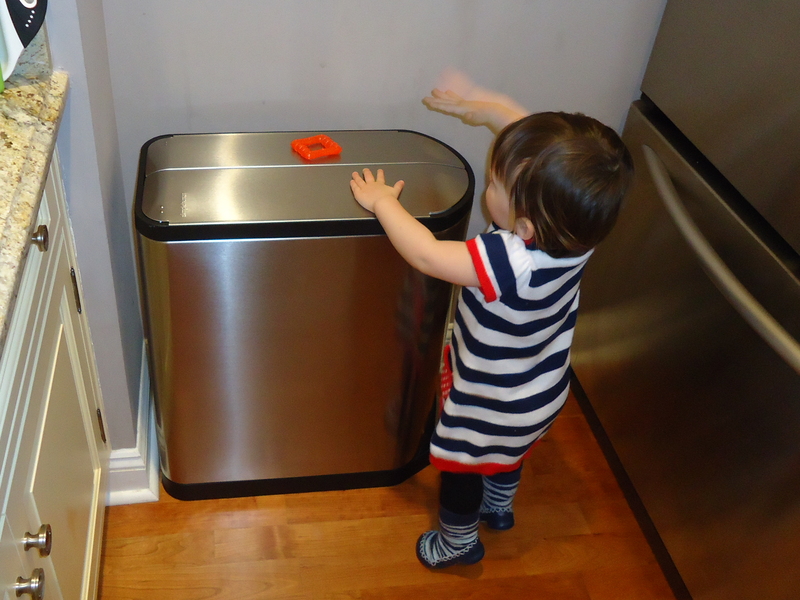 This entry was posted in Baby, Child Development, Childproofing, Family, Parenting, sick baby, Sick Parent and tagged child development, childproofing, Children, family, father, garbage can, Home, Parent, Parenting, raising children, sick. The Mad Madster finally came out swinging this morning after battling back from a skin infection and projectile vomiting. Trips were cancelled and plans were altered as Maddie pretty much slept through the Thanksgiving holiday so she could right the ship. It was tough seeing the “Little Bean” so far off of her game, but she’s feeling more like her old self this morning. We suspect that waiting in the pediatrician’s office for two hours on Wednesday afternoon might be where Maddie caught this nasty 24-hour bug. We had been home for about two hours and Maddie wasn’t interested in any dinner. When we finally gave up and tried to put Maddie to bed, the sickness beating up her little body let loose. She threw up down the hall, took a few steps and then covered her mom with the holiday brew of sickness. The next morning Maddie slept deep into the morning before we finally went in and woke her up around 9am. Maddie was wiped out and we decided that we couldn’t make the trip to her grandparent’s home. Maddie was already back in bed by 11 while her dad went out to gather up some food for an impromptu Thanksgiving dinner. Maddie slept hard and slept often through out the day and we were happy to see that she was on the mend this morning. This entry was posted in Family, Family Dinner, Parenting, Raising Children, sick baby and tagged baby, Children and Youth, family, family dinner, family time, Feeling Better, Holiday, Holiday Travel, Holidays, Madster, Parenting, sick, Thanksgiving, Thanksgiving dinner. The best part of getting your baby vaccinated in the United States is the CONSTANT misinformation, secrecy and idiocy surrounding the shots. Make sure you read about the shots before you take your baby. In our experience, doctors don’t seem to be very forthcoming no matter how many questions you ask them. 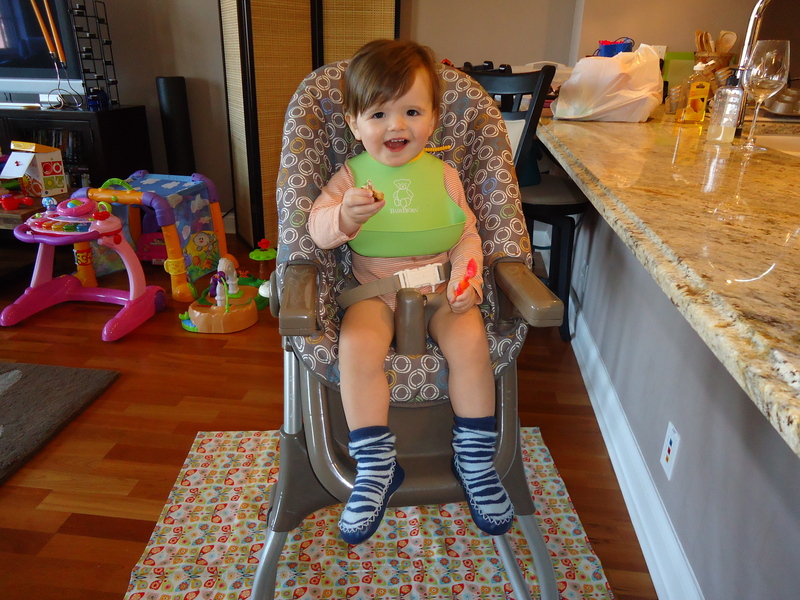 Nine days after her shots, Maddie started getting a few bumps and was unusually cranky. If we thought that was the end of it, we were sorely mistaken. Maddie woke up the next morning covered with bumps from head to toe and feeling absolutely miserable. We went back the doctor’s office to get an expert medical opinion. “Well, it could be a number of things,” said the doctor. Really??? Doc, you found the missing piece! What a stunning diagnosis! You cracked this one wide open – Move over Dr. House!! All those years in med school really paid off – Another feather in the cap for the medical community. We have been very lucky that Maddie has only been sick three times in her life. It just so happens that every bout of illness has been associated with her shots. Maddie is tougher than nails and refuses to let this latest bout of shots drag her down. It’s her parents that really seem to be having the tough time when Maddie doesn’t feel well. This entry was posted in Family, Parenting, pediatrician, sick baby, Vaccination and tagged baby, Centers for Disease Control and Prevention, DPT vaccine, Dr. House, family, Immunization, MMR, Parenting, shots, sick, vaccination, vaccine.